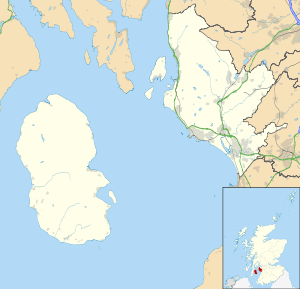 Irvine (pronounced /ˈɜːrvᵻn/ IR-vin; Scots: Irvin, Scottish Gaelic: Irbhinn) is an ancient settlement, in medieval times a royal burgh, and now a new town on the coast of the Firth of Clyde in North Ayrshire, Scotland. 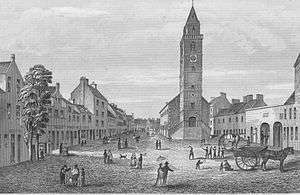 The 2011 Census recorded the town's population at 33,698 inhabitants, making it the biggest settlement in North Ayrshire. The town was once a haunt of Robert Burns, after whom two streets in the town are named: Burns Street and Burns Crescent. He is known to have worked in a flax mill on the Glasgow Vennel. Despite being classed as a new town, Irvine has had a long history stretching back many centuries and was classed as a Royal Burgh. There are also conflicting rumours that Mary, Queen of Scots stayed briefly at Seagate Castle. To this day there is still a yearly festival, called Marymass, held in the town. Part of modern Irvine contains the oldest continually inhabited village in Europe. Dreghorn, formerly a separate village, appears to contain archaeological remains dating back to the first incursions of humanity into Scotland (Mesolithic). Numerous ancient sites pepper the region. Iron Age Hill forts are abundant. Irvine is the site of an incident in 1296 during the Scottish Wars of Independence when an English army marched to Irvine to engage the Scottish army that was encamped at Knadgerhill, only to find that dissension amongst the Scots leaders was so great that armed conflict did not occur and many of the leaders changed sides and joined King Edward I. Bourtreehill, the only major Estate in the parish, was periodically possessed by all three kings and possibly the Constables of Scotland before them. Trindlemoss Loch, Scotts Loch or the Loch of Irvine was situated in a low-lying area running from Ravenspark to near Stanecastle and down to Lockwards, now represented only by the playing fields off Bank Street in the Parish of Irvine, North Ayrshire, Scotland. The loch was natural, sitting in a hollow created by glaciation. 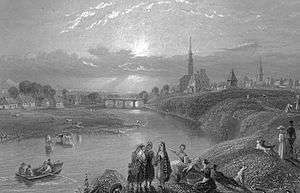 The loch waters were progressively drained and in 1691 this was finally achieved. 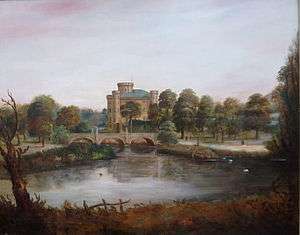 The loch and its adjacent land was purchased by the Reverend Patrick Warner (minister in Irvine 1688-1702),who had sought refuge in the Netherlands after the Battle of Bothwell Bridge. It has been suggested that it was during this exile that he learned the skill of land reclamation. Irvine Harbour is home to a unique and distinctive building which marked the tide level. It was built in 1906 and devised by Martin Boyd, the harbourmaster at that time. The Automatic tide signalling apparatus indicated the tide's state in two ways depending on the time of day. During daylight, the level was marked with a ball and pulley system attached to the mast. At night, a number of lamps marked the tidal level. Unfortunately the building has fallen into some disrepair and the mast partially dismantled. There have been plans to try to refurbish this unusual building which so far, have come to nothing. The harbour and surrounding area became an area heavily blighted by industrial waste even long after some of the industries were gone. There was a waste bing known by the locals as 'The Blue Billy' due to the colour of the waste there. During World War II a Royal Observer Corps watchtower was sited here giving a wide overall view of the Firth of Clyde. It is also credited with the first visual sighting of Rudolf Hess's Messerschmitt 110 in 1941. 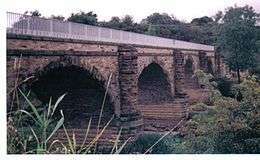 IDC was widely criticised for some of their actions including the demolition of large swathes of the Fullarton part of the town, the bridge and most of Bridgegate in 1972 and 1973. One positive development of IDC's was the Irvine Beach Park from 1975 and the Magnum Leisure Centre opened in 1976. This area, behind the harbour had been largely industrial wasteland for many years and was regarded as an eyesore. The area was developed with vast amounts of greenery making it a pleasant place to walk. IDC and the Urban Regeneration Company have plans to redevelop much of the waterfront area. Surrounding towns and villages along the coastline are included in a number of the regeneration proposals. Irvine circa 1870. The old Parish brig, kirk, manse and the site of St. Inan's well. There is a Community council in Irvine. However, unlike counterparts elsewhere in Scotland, it opts not to use 'Royal Burgh of' in its title. The motto used on the coat of arms of the Royal Burgh is 'Tandem Bona Causa Triumphat.' This means "The Good Cause Triumphs in the end". The Westminster Constituency of Central Ayrshire is currently held by the Scottish National Party. The Member of Parliament is Philippa Whitford. The Scottish Parliament Constituency of Cunninghame South is also held by the Scottish National Party. The Member of the Scottish Parliament is Margaret Burgess. At the 2014 Scottish independence referendum Irvine went against the national trend where 28 out of 32 council areas voted against the proposal for Scotland to become an independent state on a margin of 55.3% No to 44.7% Yes. In the Irvine West electoral ward 6,543 votes were cast in favour of independence compared with 6,397 votes cast against the proposal, with a vote share of 50.56% "Yes" to 49.44% "No". In Irvine East there were 7,111 "Yes" votes and 6,811 "No" votes, on a vote share of 51.08% Yes to 48.92% No. For Irvine as a whole there were 13,654 "Yes" votes and 13,208 "No" votes, breaking down to 50.83% Yes to 49.17% No. Kris Doolan, professional footballer for Partick Thistle in the Scottish Premiership. Widely regarded as one of the best players of the modern day. Nicola Sturgeon, the Scottish Government's First Minister for Scotland and leader of the Scottish National Party. Simon Neil, singer, born in Irvine in 1979. 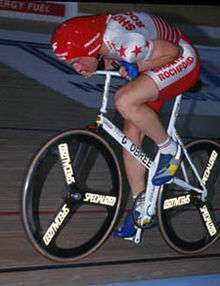 Dr Colin Dryden, famous paediatric anaesthetist, born and raised in Irvine. Gifted amateur poet and actor/singer. Andrew Wilson, Scottish international footballer and all time record goal scorer for Sheffield Wednesday, he also captained the Owls to two English league championships and an FA Cup victory, born and died in Irvine. 1 2 "Irvine Area Profile - 2011 Census". Scotland's Census. Retrieved 2015-10-05. ↑ Cowing, Emma (19 December 2010). "Stone of Destiny 'from Ayrshire, not Perthshire'". Scotland on Sunday. ↑ Thomson, Peter G. (1989) The Good Cause, p. 34. Cunninghame District Council, Irvine. ↑ Clan family histories - Irvine. Accessed : 2010-02-14. ↑ Briggs, Billy (18 March 2012). "Clipper ship City of Adelaide finds berth in Australia : UK news". The Guardian. Retrieved 23 March 2012. ↑ News, BBC (18 September 2013). "Weather delays City of Adelaide journey to Australia". BBC News. Retrieved 16 December 2013. ↑ Wilson, Professor. (1870) The Works of Robert Burns, Pub. Blackie & son. London. ↑ Brown, Lex (1 May 2009). "Irvine toddler's disappearance to feature on TV". Irvine Herald. Archived from the original on 6 October 2011. Retrieved 15 April 2015. ↑ Strawhorn, John (1985). History of Irvine. John Donald. p. 15. Shewalton Sand Pits Nature Reserve. Commentary on the old Bogside Racecourse. Chisholm, Hugh, ed. (1911). "Irvine". Encyclopædia Britannica (11th ed.). Cambridge University Press.